Why buy tortillas from the store when you can make my delicious corn tortilla recipe right at home? Sure it’s easy to just buy some at the store. But homemade ones have a flavor and aroma you can’t buy at the grocery store. And this corn tortilla recipe is amazingly quick. My last batch took less than 35 minutes from start to finish. When someone mentions the word tortilla. most people think of flour tortillas. And while they are excellent, let me make you aware that corn tortillas, especially homemade ones from scratch, are just as good and even healthier. Just in case you were wondering, here is some dietary information for our corn tortilla recipe. Keep in mind these numbers don’t take into consideration the 1 tsp. of shortening in my recipe. There are about 60 calories in a 6 1/2 inch tortilla, 12 grams of carbohydrates, 1 gram of protein, 44 milligrams of calcium, and 1 gram of fat. They are also gluten free. Sounds pretty good doesn’t it? Just wait till you taste them. Did you know there is an association called the Tortilla Industry Association (TIA)? It was created in 1990 to promote the ever growing tortilla industry. Tortillas have become so popular that they outsell bagels, croissants, muffins, pita bread and all other ethnic breads combined. It’s amazing this traditional Mexican bread has become such a mainstay in the U.S. market. So are you ready to give these a try? They are the perfect accompaniment to fajitas, enchiladas, chile verde or even eggs. In fact you can serve our corn tortilla recipe with just about any kind of meal. And you can stuff just about anything you can think of in a warm tortilla, and create your own special taco or burrito. Mix the masa harina (corn flour, not to be confused with corn meal) and salt in a medium sized bowl. Measure 1 1/4 cups of boiling water and the shortening into a separate pan or bowl. Stir until the shortening is melted. Pour this mixture into the bowl of corn flour and mix with a fork. When the mixture is cool enough to touch (a couple of minutes) mix the dough with your hands. The dough will probably be a little dry. Add hot water one teaspoon at a time until the dough stays together and doesn’t crumble apart. Knead the dough for one or two minutes. Play with the consistency by adding more water if needed. What you want is a dough that is moist enough to stay together but not too sticky. Have you ever heard of a tortilla press? 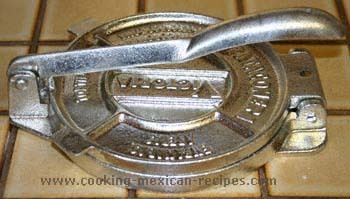 They are designed to help you create perfect corn tortillas fast. 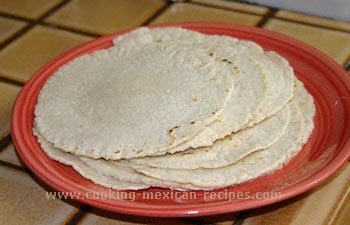 This corn tortilla recipe can be made without one but they sure make tortilla making a snap. And they are fun to use. If you have kids, ask them to help you press tortillas. The’ll love it. Here is the one I use and I love it. If you don’t have a press yet, you can simply roll out the dough with a rolling pin. Just make sure you cover the dough with plastic, as per these directions . Pinch off some dough and roll into smooth round balls (golf ball size) with your hands. 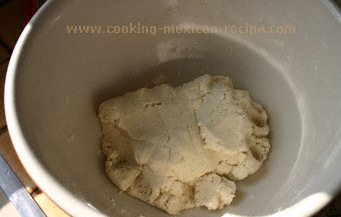 Masa for tortillas is not like pie dough so don’t worry about over handling it. I would suggest covering the dough you’re not working with, with either plastic saran wrap or damp paper towels to keep the dough from drying out while you are making golf balls. Flatten the ball a bit in the palm of your hand. Did I mention that you should be pre-heating a cast iron or comal pan over medium high to high heat? Now’s the time. And don’t put anything in the pan like shortening or Pam. You don’t need it. If you are using a tortilla press, first get yourself a Ziploc type bag. Sandwich size or gallon size will work. I like to use this type of plastic because it is thicker and easier to work with. Cut it in half so you have two separate pieces. Lay one piece on the press and then place the slightly flattened dough on top, a little bit closer to the hinge of the lid like in the picture. 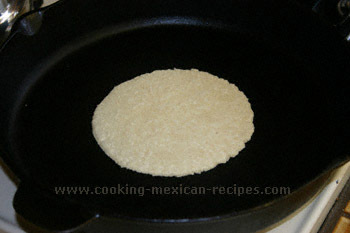 Cover the dough with the second piece of plastic and close the lid to flatten the tortilla. Notice how nice this came out. Carefully peel the top piece of plastic from the tortilla. 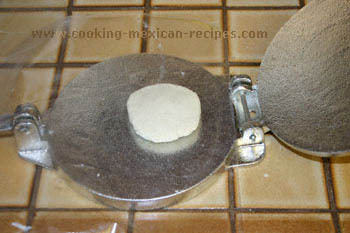 Lift the tortilla and the bottom piece of plastic from the press and place it in your hand, dough side down. Now carefully peel the bottom piece of plastic from the tortilla. I did not have any problem with the dough sticking to the plastic. If you do, it probably means your dough is too wet. Try adding a sprinkle of corn flour and kneading the dough a bit more. Place your tortilla in the preheated cast iron pan or comal and cook for 45 seconds to a minute then turn over and cook for another 45 seconds or longer. Place cooked tortillas in foil and cover with a clean kitchen towel to keep warm. 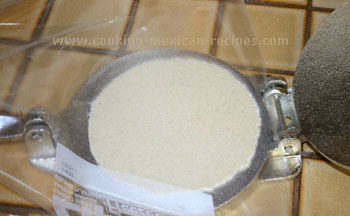 Store tortillas in a Ziploc bag in the refrigerator for several days. Here are the results of our corn tortilla recipe. These are absolutely the best served with chicken fajitas. Looking for flour tortillas instead of corn?